Sick of getting a heap of clicks from your Adwords campaign but not getting conversions? Chances are – from what I’ve seen when look at other people’s accounts – ad groups are not setup properly and you’re paying for traffic that will never leads to sales and leads. Let’s get your ad groups sorted so you can start taking control over your traffic. Having control over the keywords you’re bidding on is key to creating an Adwords Search Network campaign that will produce a strong return-on-investment. This starts well structured Ad Groups and is actually quite simple to do. This is the process I follow to create well structured ad groups that prevent bad traffic. Quickly, how do Ad Groups fit-in? When someone does a search for your product or service it should neatly trigger just one of your Ad Groups. This is done so you can both control the bids based on the quality of the ad group but also to write ads that directly represent the keywords being searched for. The first thing I do is write down a list of all the search terms (what a person enters when conducting a search) that come to mind that I’d like to target in my campaign. Don’t worry about trying to make them fit into the right ad group yet – just make a list of what you think people will search for. I’ll continue with the Brisbane based mobile truck mechanic I used the other week. This list is relatively small due to the specific market the business is focused on. Your list may be a lot longer. Go through the list of search terms and sort them so the search terms that best represent your business go first and the least specific go last. For this example even though they are a diesel mechanic, they are actually a Brisbane based mobile truck mechanic so those search terms should go first. It’s easier to sell to someone looking for exactly what you offer, especially if you have a unique selling point, rather than trying to convince them you can do everything. Focus on those unique selling points as that’s what will get you above the competition. Yes, you can do the work that a mechanic can do at a fixed location but so can a heap of other businesses; you’re mobile so you want to exhaust those opportunities first. 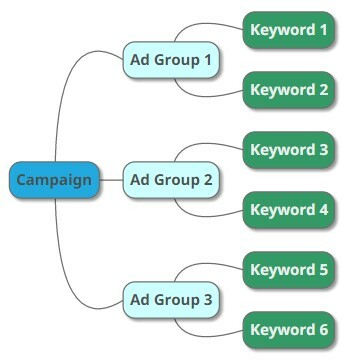 Consolidate this sorted search terms list into Ad Groups and Create Adwords Keywords. Now we have to consolidate this list of search terms into their own ad groups. To do this you need to find the common words between each phrase but also take into account the words that also make them unique. This is one of our ideal search terms – we deliver exactly what this person is searching for. People use “mechanic” instead of “repairs” so the issue will be something we should be able to fix. They include the city name so they are looking for a business and experience shows that searches that include the city name are more likely to convert to a lead. When I create my initial ad groups I like to use two types of keywords: broad modifiers and exact searches. A broad modifier is a keyword that includes a preceding + symbol and it means that the search must include that keyword but it can be in any order. 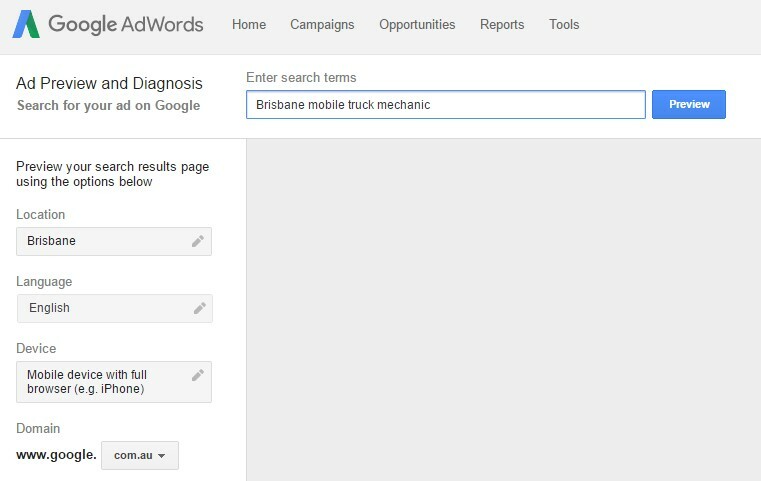 So +mobile +truck +mechanic +Brisbane will trigger for searches such as “best Brisbane mobile truck mechanic” or “I need a mobile truck mechanic in Brisbane”. Due to the nuances with Google, a phrase match may not be triggered and as long as you use the broad modifier you capture a lot more long tail traffic. Same as above but for another major city we do a lot of business in. Another reason you create separate ones for the major cities you service is so that you can accurately include the city name in the ad’s copy. This will give you a higher click-through rate and also give the searcher confidence you do service the area. There are a lot of businesses who advertise outside their area and this just frustrates the searcher when trying to give them business. Repairs may not be specific enough so it’s been moved into its own group. The ad would ideally mention truck repairs but also that you’re a mechanic to give the searcher a heads-up. These search terms don’t mention one of our major cities but may still include a location. The campaigns location settings which make sure the searcher is still within the service area so that will prevent most traffic we can’t service. This ad group introduces an issue though – if someone searches for “mobile truck mechanic Brisbane”, what’s stopping this ad group from being triggered instead of the one we want above made specifically for that search term? If a control isn’t put into place then your search terms are going to go wherever Google thinks is best, and Google isn’t always right. What you need to do is start using negative keywords to make sure someone searching for a Brisbane or Logan service does not end up in these ad groups. An ad group negative of +Brisbane and +Logan will do the trick. As above but for the less ideal “repairs”. We’re now getting further away from the businesses core focus. Yes, you are a mobile diesel mechanic but your focus is on trucks. Someone chasing a diesel mechanic may be looking at other machinery or 4WDs etc. You place this in its own ad group so you can see whether the leads are worthwhile. You would mention you’re a truck mechanic in the ad to prevent unwanted calls. Now if a person searches for “mobile diesel truck mechanic” then that’s actually right on target and we don’t want that search term to trigger this ad group. Anything with “truck mechanic” or “truck repairs” should be triggering the higher focused ad groups above. Once again some negatives and keep everything going where we want. If you ad a negative of +truck to this ad group then the truck ad groups above will get triggered instead. Same points as for the diesel mechanic – not all this traffic will be suitable but some may be. This ad group can be copied and modified for Logan. This one doesn’t mention a city we target so we have to add them to the negatives list to keep them from triggering this ad group. This is the first of our ad groups that doesn’t mention the need for a mobile service. They have stressed urgency though so this is still a high potential lead as a mobile service might be able to sort this issue faster than a workshop. We want to keep the mobile search terms in the groups above though so include a negative keyword of +mobile to keep them filtered. This ad group can be copied and modified for Logan. We’ve now moved away from mobile and urgent repairs so we’ll be competing with workshops and larger mechanics. These searchers may have more time for a fix and happy to wait to save costs. These ad groups are here to get more traffic but they’re expected to have lower conversion rates. Negatives need to be added to filter out the mobile and urgent search terms. This is just following the same ad groups we had for mobile – but with mobile removed. No city included for this ad group so make sure to include them as negatives. Your ad groups are now set up so you can create ads and bids based on the quality of the search terms being used. If the traffic is sufficient then you might even want to keep the less focused ad groups paused while spending your budget on the good ones. You will at least have your ad groups structured in a way to get a good idea of the performance of different search terms. To make sure everything is working as planned then make use of the Adwords Preview Tool to see which Ad Group is being triggered. Even if your campaign isn’t running it will tell you the ad group that should have run. Hopefully that helps you understand how your ad groups should be structured to split different levels of search terms into something that is manageable and more predictable. I understand this might be a bit confusing if you aren’t familiar with the process so please let me know if you have any questions or would like some help working through it.